General Plastics Manufacturing Company has been an industry trailblazer for seven decades. Founded in 1941 by L.W. Schatz and still privately held, our company began as a manufacturer of preservative coatings for wood and other organic materials. Later in the 1940s, we ushered in the composites industry with new phenolic-resin plastic laminates for aircraft and commercial uses. During the 1950s, Schatz identified a prime opportunity in the polyurethanes that came out of World War II. By specially formulating these materials, we pioneered our acclaimed rigid and flexible polyurethane foams with unique cell structures, creating foam blocks that addressed a wide array of aerospace applications. Our company later began fabricating parts for high-performance structures. With the dawn of the Jet Age, our new flame-resistant, high-density foams became the preferred replacement material for wood cores in aircraft composite “sandwich” panels. Beyond the aerospace and defense partners our company has served since its earliest days, we are privileged to support engineers and design teams in many dynamic industries. Today’s LAST-A-FOAM® products, offered in densities ranging from three to 50 pounds, satisfy a wide spectrum of applications. In addition to producing our signature rigid and flexible polyurethane foam sheets, we also mold, machine, fabricate and construct parts and assemblies for diverse commercial, industrial, military and composite-manufacturing applications. 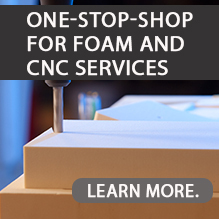 We also offer custom foam formulation for specialized needs. All General Plastics foam material and build-to-print parts are produced in our 135,000-square-foot manufacturing facility in Tacoma, Washington. Our company employs more than 170 skilled, passionate professionals and is optimally equipped to satisfy our customers’ needs for premier-quality foam material and production parts. Benefit from broad and deep expertise. Our team includes chemical engineers, synthetic chemists, physical chemists and certified quality engineers to support you with innovative solutions. Regardless of role, the people of General Plastics stand behind all of our LAST-A-FOAM® materials and fabricated parts, ensuring unmatched performance and long-lasting value in any application. Ongoing research and development equip us to continually introduce new materials and make our existing products even better. Count on consistent quality, backed by rigorous inspections and testing, and certificates of conformance. General Plastics focuses on building enduring relationships with our customers, employees and distributor partners. Earning that trust drives everything that we do: Supplying materials and parts of the highest quality and uniform consistency. Developing novel products and cost-effective approaches. Ensuring on-time delivery – and delivering exactly what we promise. We have forged long-term partnerships with such aerospace industry giants as The Boeing Company, ATK and Lockheed Martin. In fact, we have supplied The Boeing Company for 50 years, and we have been recognized with the Boeing Performance Excellence Award for the last four years. For seven decades, General Plastics’ high-quality materials and cost-effective solutions have enabled exacting customers around the world to attain their goals, aim higher and redefine what’s possible. We are passionate about continually expanding our expertise, products and services to propel your success. From the ocean's depths to deep space, we provide our customers innovative solutions that shape great ideas in to reality. On Dec. 1, 1941, General Plastics opened its doors to enter the rapidly expanding aerospace industry. 75 Years since its inception, we now see General Plastics as a global leader in manufacturing polyurethane foam and built-to-print composite parts. See what our customers say about dedicated customer service and the product solutions we provide. Find out the latest with General Plastics! We seek talented, creative, dedicated and professional individuals with a can-do attitude. Check out our job openings.